FILE - Ukrainian armored military vehicle BTR 3E takes position prior to a test firing at the shooting range of the Kiev's armored plant, in Kyiv,Ukraine. U.S. Secretary of State John Kerry has told a group of European foreign ministers that Russia and Ukraine both must work to end tensions and restore the cease-fire in Ukraine. Kerry spoke Thursday at the annual ministerial council of the Organization for Security and Cooperation in Europe, a two-day session held in Belgrade, Serbia. In his remarks Kerry said Russia should help with the removal of Russian forces in eastern Ukraine and allow unfettered access to OSCE monitors in the war-torn region of Donbas. He said Ukraine needs to do its part to restore the cease-fire and begin rebuilding Ukraine's eastern regions. U.S. Secretary of State John Kerry, left, takes his seat to participate in the Organization for Security and Cooperation in Europe (OSCE) ministerial council meeting in Belgrade, Serbia Thursday, Dec. 3, 2015. 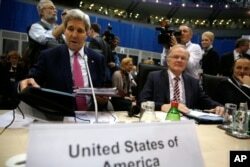 Kerry said the OSCE has made much progress in its 40 years of existence, but more remains to be done. He said OSCE members must do more to increase information-sharing among their armed forces, and increase efforts to protect human rights and eliminate bigotry. He said in too many countries, nongovernmental organizations and the media are facing restrictions, and he added that there is "no excuse" for abusing the rights of citizens, preventing journalists from doing their jobs, or silencing political dissent. On Wednesday, Kerry visited Kosovo and Serbia, where he met with top officials. Speaking to reporters in Belgrade, where he met with Serbian Prime Minister Aleksandar Vucic, Kerry praised Serbia's progress toward integration into the European Union, including making Serbia's economy more open to foreign investment. 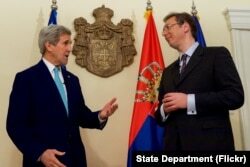 Kerry also praised Serbia's progress in dialogue with neighboring Kosovo, where tensions remain over territorial claims. On his first trip to Kosovo as secretary of state Wednesday, Kerry met Prime Minister Isa Mustafa, and called for efforts to calm heightening tensions in parliament. In the past two months, opposition lawmakers have repeatedly set off tear gas inside Kosovo’s parliament, demanding that the government overturn a European Union-brokered agreement with Serbia to give more power to Serb-dominated areas in Kosovo and an agreement with Montenegro on border demarcation. Opposition parties, led by the Self-Determination Party and the Alliance for Kosovo's Future Party, maintain that the agreement with Serbia represents a threat to the country's independence. Kerry said the deal would be good for Kosovo, stressing that the United States “would not support any agreement that would threaten the sovereignty, or the security, or the independence of Kosovo." He also expressed U.S. concern over Islamic radicalization in the country. Dozens of Kosovars are believed to have traveled to Syria to fight for Islamic State. Kerry sought tougher action by the government to prevent Kosovars from joining IS in Iraq and Syria.